Soda Pop or Water Bottle Fountain Drinker Cup with Spring Quail Chicken Bird | Fountain City Art Ctr. Huge Savings Item! Save 19% on the Soda Pop or Water Bottle Fountain Drinker Cup with Spring Quail Chicken Bird by Sunday Market at Fountain City Art Ctr.. Hurry! Limited time offer. Offer valid only while supplies last. 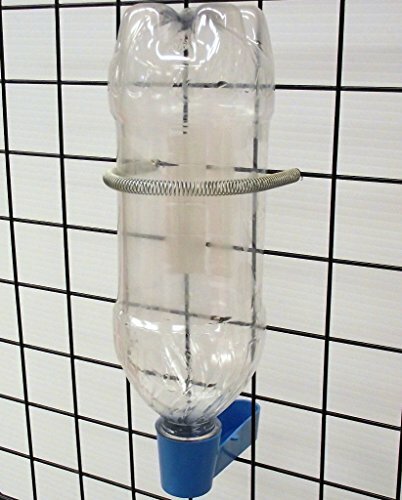 This listing is for 1 Blue in color soda pop/water bottle fountain drinker with bottle mounting spring. Simply connect your old soda or water bottle to the fountain and you are giving your bird/pet a waterer and keeping your soda bottles out of a landfill. For convenience and economy. This fountain lets you use a bottle hanging on the outside of your bird and small animal cages. The fountain is of smooth plastic, snaps securely on the neck of some 12 to 16 ounce bottles and projects through the wire 2 inches inside the cage. spring is furnished for looping around the bottle to hold it on the cage. Easy to refill, easy to clean. Fits thru a 1 inch squared or larger cage opening. If you cage has squared openings smaller than 1" no big deal, just snip out the wire to give you a 1" opening. NOTE: This will not work on coke and pepsi plastic bottles with the new eco friendly caps. The threads on these new bottles are too short to reach the base of the waterer. These drinkers work best with real glass 12 oz pop bottles. They still sell them in grocery stores. They also work well with some plastic bottles but they need longer threads to reach the base of the waterer. A lot of off brands have the longer threaded cap ends. Eco frindly bottles DO NOT WORK. If you have any questions about this product by Sunday Market, contact us by completing and submitting the form below. If you are looking for a specif part number, please include it with your message.